Christmas Ornaments Made in USA - 2008 U.S. Capitol Lincoln's Second Inaugural Address Or - A Christmas Ornament Co. 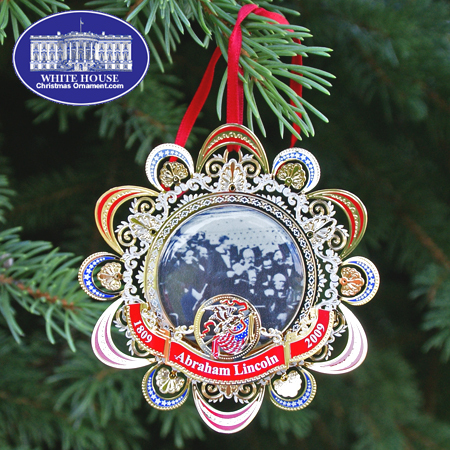 The White House Ornament Collection presents The 2008 US Capitol Abraham Lincoln's Second Inaugural Address Ornament. This ornament shows Abraham Lincoln, the 16th President of the United States, delivering his Second Inaugural Address which includes the immortal words, "With malice towards none, with charity for all…" This speech, delivered at the East Front of the US Capitol on March 4, 1865, has become one of the most famous in American presidential history and is inscribed on the wall at the Lincoln Memorial in Washington, DC. Against the backdrop of the close of Civil War, President Lincoln used the speech to "finish the work we are in, to bind up the nation's wounds" and set his vision for the post-war reunification of the country.